Miss Elaine Seersucker Robes - Lounge around in serene comfort with Miss Elaine zip robes in seersucker, brushed back satin, and cotton knit. 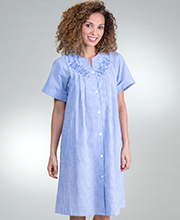 Miss Elaine zipper robes are trimmed with beautiful embroidery and many have a zipper front for easy-on comfort. Be luxuriously fashioned in a Miss Elaine seersucker robe, a cotton robe, a bathrobe with zipper, a plaid robe, a snap front robe, a short robe, or a floor length robe.